What do you think of when you hear the word 'conference'? Branded bags filled with flyers and free mints? Awkward conversations over coffee and muffins - about the coffee and muffins - before you head into the opening keynote? Trying to speed network over a plate of buffet food? "Our goal is to shift the attendees from being spectators to being actors," Antoine Roy-Larouche, Director, Collaborative Experiences, explained, "C2 is about living something that will transform you." When you ask most people why they attend conferences – especially with so many talks available online – they’ll often reply with the same answer: the networking. The best conferences in the world attract the best attendees and C2 prides ourselves on the types of people who attend each year. C2 works with local Montreal-based EdTech platform E-180 to transform the C2 village into a bustling peer-learning hub. In 2015, thousands of participants used the application to connect and learn from one another through one-on-one learning meetings – or ‘Brain Dates’, as E-180 calls them. Aside from the app, there is also a Brain Dating Lounge where trained matchmakers help you find your match. The idea is that you get to plan one-on-one meetings in advance, so that you get the most out of your time at the event, find out who are the people you should meet, and maximise your learning and networking opportunities. But if you still don’t know where to start, you can always lean on your trusted Concierge Extraordinaire. As a C2 participant, you will arrive and be greeted by a Concierge Extraordinaire whose sole job it is to provide participants with a preferred point of contact, to assist them in the discovery and navigation of the conference, as well as the surrounding city of Montréal. And you won’t receive a tote bag filled with sponsor ads and be sent away, instead, you will be guided on a hero’s journey, one that begins with a tour of the C2 village, which includes the forum, the hangar, and the plaza. The forum is also where you will watch the incredible speakers who have been carefully selected to not only fit, but also challenge the theme. The C2 programming team conjures a speaker roster designed to inspire participants. Inspiration comes in many shapes and sizes, and the curated lineup of speakers strives to include both next-generation up-and- comers and established innovation icons. The curators search far and wide for just the right stories to build the narrative. Between the speakers are artistic performances that bring another dimension to that narrative. "When the doors close and conference begins, you can expect to live an experience," says Pintal. – encourage the cross-pollination of ideas. 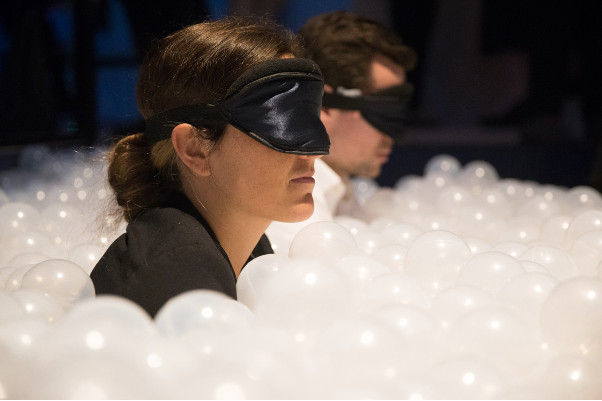 What Roy-Larouche is referring to are experiences like the ball pit from 2014, where participants submerged themselves to their shoulders in clear, plastic balls while wearing a blindfold before they brainstormed on questions posed by someone they can’t see. The blindfold removed any bias on the part of participants as they interacted, which was significant as one of the people joining the brainstorm was Muhammad Yunus, Nobel Peace Prize recipient. The blindfold allowed the participants to speak freely in a situation that may have made them nervous.